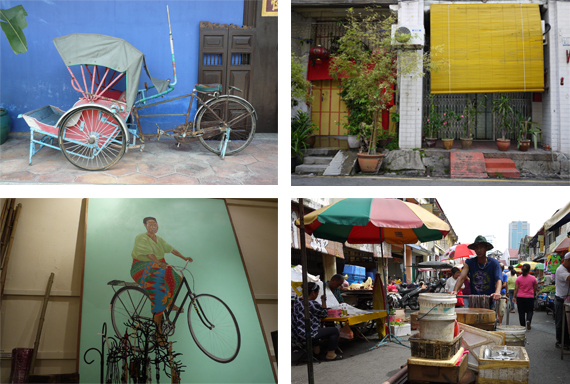 Since George Town received the World Heritage title from UNESCO, jointly with Melaka as historic cities of the Straits of Malacca in 2008, it has experienced growing attention and underwent rather significant transformations. Could it be that heritage in George Town is not as much about the past as it is about the next generation? While some local people express nostalgia toward the “pre World Heritage” days, others are working to push George Town forward as a place where culture is not only embedded in its past but also lives through new practices and events. The city currently reflects a multi-layered cultural heritage, which developed over 500 years of trade and cultural exchanges between the East and the West, as well as added features that have more recently emerged as inevitable side-effects of a rapidly-expanding tourism industry. It is at this junction that George Town is now looking to achieve a fair balance to sustain its unique character and allow the kind of transformations that can generate sustainable communities and livelihoods. The uniqueness of this former colonial trading post connected by ferry across the 3km North Channel, can be immediately sensed through its built environment. The multicultural charm derived from its Buddhist, Hindu, and Muslim history imbues the town’s streets, food markets, buildings, and people. 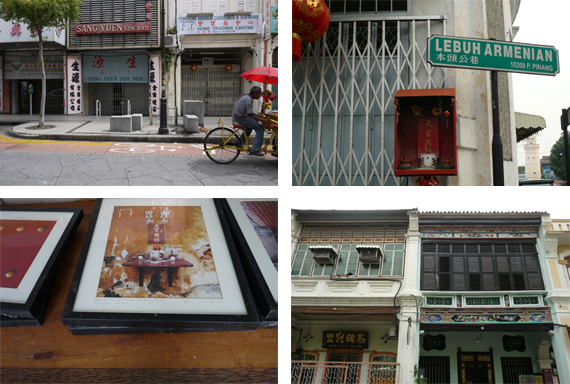 The intangible cultural qualities that are reflected through the diversity of religions, languages, arts, and everyday life participate in George Town’s distinctive character. Still, the local perceptions on this historic town seem to have evolved over the years. Some long-time residents deplore its current state and fear the rapid commercialization of certain neighbourhoods. A policy on conservation areas was introduced in George Town in the 1970’s, however some rapid urban development included the construction of a bridge connecting the island to the mainland Seberang Perai in 1985, which increased motorized traffic, and sparked an important conservation movement. Today one of the most active organizations is the Penang Heritage Trust (PHT) led by Khoo Salma, a 5th generation Straits Chinese (Baba Nyonya). The not-for-profit organization is committed to ensure the preservation of George Town as a place and a community through various initiatives that span from educational programmes to “heritage alerts” and art festivals. Valuable partnership programmes were facilitated by the Trust over the past year. One is the apprentice programme for artisans, in partnership with Think City, that brought 6 traditional artisans and young people to work together on craftsmanship such as Nyonya bead work, rattan weaving, signboard/wood carving, and hand making of footwear. Another is a student internship programme with Osaka City University, Yokohama City University, and Ritsumeikan University and in which a couple of students were selected to research on heritage conservation and the revival of traditional crafts. But perhaps the highlight in 2011 has been a collaboration with the George Town Festival to celebrate the 3rd anniversary of George Town’s listing onto the UNESCO World Heritage list. Tapestry of Culture was a 3-day street celebration comprising 47 individual programmes that featured local arts, cultural performances and crafts. The George Town Festival (GTF) was first launched in 2010 as a multidisciplinary event for arts and heritage and attracted an audience of 600,000 people including tourists from 42 countries. Success grew in 2011 with over 80 events held at 38 venues and streets across the city. 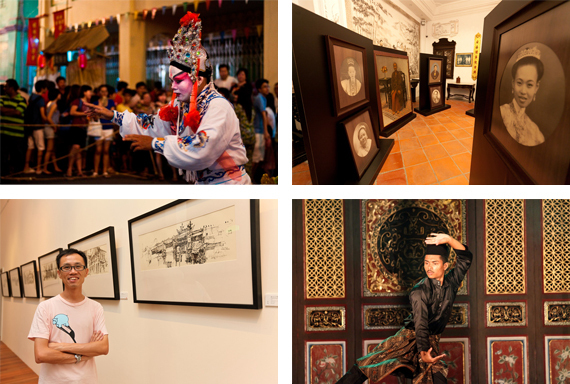 The main objective of the Festival is to showcase the unique diversity of George Town’s art and heritage in the context of its World Heritage site environment and serve as a catalyst to encourage cultural exchanges. 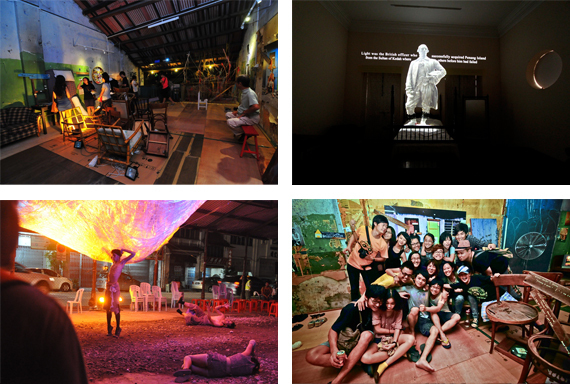 Events from this year’s edition included the Living Museum Project, a series of shared family portraits, mementos and anecdotes that reveals close ties between George Town and its community; Line Line Journey a solo exhibition of Ch’ng Kiah Kiean’s contemporary graphite drawings depicting the transformation of George Town’s streetscapes over the years; No. 7 a commissioned performance by Kaylene Tan and Tan Kheng Hua, set inside the historic Blue Mansion, and inspired by Tan Tay Po, the seventh wife of Chinese tycoon Cheong Fatt Tze, tells about a journey where the personal, the fictional, hearsay, and history intertwine. Opposites attract in George Town when the old and the new merge in unconventional ways. The DA+C Festival, which took place during the George Town Festival, focused on connecting young people with the city's existing environment in order to spearhead creativity. The festival's programme included interactive experiences that used heritage buildings as premises for cutting-edge installations. Talks were held to discuss the reconstruction of heritage sites through digital arts, and the expansion of world heritage sites with digital means. By drawing parallels between cultural preservation and contemporary creativity, the DA+C Festival introduces a new mindset on heritage and traditions, and breaks conservative boundaries associated to the kind of preservation that can hinder the flourishing of creativity. George Town may be renowned for its history and stunning built environment, but "backstage", people are connecting the dots, from past to present and into the future by preserving and generating meaningful experiences that take the city beyond its World Heritage title. The existing cultural heritage could turn into a more sustainable promise if George Town develops its capacity to retain and inspire young generations, while instilling into them a sense of pride about the place they call home.